In what has to be the most amusing internet quirk of the day, Her Majesty's Revenue and Customs' guide to avoiding social security fraud has attracted some attention from the blogging community. As revealed on the ever-brilliant Guardian Unlimited Tech blog, currently, the text for the entire guide, bullet points and all, is holder text repeating "(This text has been withheld because of exemptions in the Freedom of Information Act 2000)" on every line. We contacted the very friendly press office who explained to us that the manual pages are for internal use, but published externally with sections that are not considered relevant or appropriate for the public removed and replaced with the holder text. "Further to your enquiry about the HMRC website, I would like to stress that our website has not been hacked and changed," a spokesman told TechRadar. 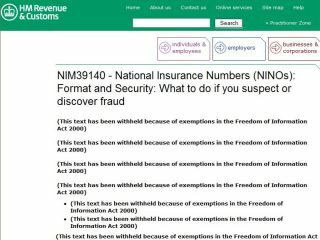 "These are internal HMRC guidance manuals, which we publish online for information. All such manuals are published on our web site, but we have to redact or remove certain pieces of guidance that cover security procedures for obvious reasons. "We do not publish internal fraud detection practices/guidance to the wider world; in this case, all the text had to be withdrawn."